Why is 2018 such a significant year? 2018 is the centenary of winning Votes for Women. On 6 February 1918, the suffrage campaign was victorious ~ at long last! Women over 30 (or at least the great majority of them) finally won the right to vote in parliamentary elections. (Votes for all women over the age of 21 was achieved only in 1928 ~ full equal voting rights with men.) So I’m definitely celebrating on 6th February! Helen Bradley, Miss Carter Came with Us, 1973. Annie Kenney speaking in Oldham. Why was 1918 so important a victory? The struggle for women to win the vote on equal terms with men had begun half-a-century earlier. In 1866 a women’s suffrage petition was presented to Parliament. The National Union of Women’s Suffrage Societies (NUWSS) was formed in 1897, led by Millicent Fawcett. Radical Suffragists. 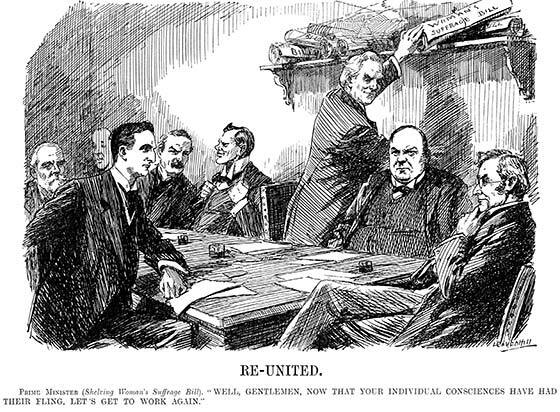 And in 1903 Emmeline Pankhurst formed the Women’s Social and Political Union (WSPU), which soon adopted militant tactics. However, any real progress soon got bogged down at Westminster in party political stalemate. 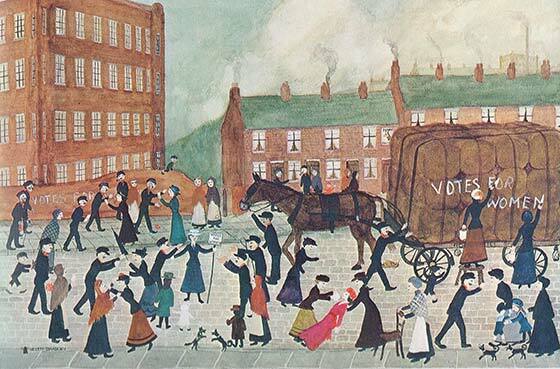 When anti-suffrage Asquith became Prime Minister in 1908, women’s suffrage campaigners responded to this challenge with a rich range of imaginative propaganda: banners, vanners, processions. In Rebel Girls I wrote about Colne Valley banner-maker Florence Lockwood; and about one caravan tour across Yorkshire ~ including Whitby harbour. I particularly like this photo, as it captures both the speaker and her audience. Left: NUWSS van at Whitby, Aug 1908. The Women’s Library. Right: Florence Lockwood’s banner. Tolson Museum, Huddersfield. Why was the women’s suffrage campaign so prolonged? Campaigners used a variety of techniques: NUWSS suffragists relied on constitutional tactics (keeping within the law), while suffragettes in the WSPU deployed militant techniques: breaking the law & so risking imprisonment. The struggle with Asquith’s Liberal Government grew increasingly bitter ~ especially from 1909 when it began forcibly feeding hunger-striking suffragettes in prison. Before long, observers looking across the English Channel were aghast. Here was Edwardian Britain, the world’s first industrial nation, which had become ‘the storm-centre of the women’s rebellion’. Yet Asquith’s Government still was no nearer to enacting Votes for Women. Jill Liddington is a writer and historian. Her main research interest lies with women’s history ~ most especially the Votes for Women story. Her book, Vanishing for the vote, was published by MUP in 2014. Learn more about Vote 100 and the associated events Jill is speaking at, here. Category: Blog, Events, History, Social History	0 Comments.